Lydia Metral (Grenoble, France, 1986) is a self-photographer graduated in 2015 from EINA (Centre Universitari de Disseny i Art de Barcelona) in photography and editorial design. 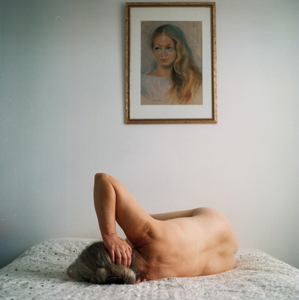 She focuses her personal photography projects on intimacy. Her work has been exhibited and projected during collective exhibitions in France and Europe : Beaurepaire Gallery (2012, Paris), La Nuit de la Photographie Contemporaine (2013, Paris), Les Nuits Photographiques de Pierrevert (South of France, 2014), La Jetée gallery (Marseille, 2015) Espacio Barra de Ferro (Barcelona, 2015), Cadàver Exquisit (Barcelona, 2015 &amp; 2016), la Fontaine Obscure gallery (Aix-en-Provence, 2017), 33/45 gallery (Barcelona, 2017), Helsinki Photo Festival (Helsinki, 2017).